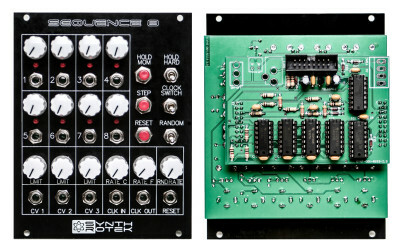 The ‘Sequence 8’ analog 8-step sequencer is a traditional 8-step sequencer with some extremely handy features. It’s available in 2 formats: Eurorack or 9V battery/wall wart (the kit version has a FRAC power option). – 3 CV Outs, each with their own attenuator, 0-5 volt output. Hello, since the 16 step sequencers appear to have now been discontinued; is there a way to set up 2 separate 8 step sequencers and arrive to the same? You can absolutely use 2 x Sequence 8’s to make a 16 Step Sequence, although you will have to use a Clock Divider and a Sequential Switch in your system in order to do pull this off. Run one Sequence 8’s Clock Out to the second Sequence 8’s Clock In, then take second Sequence 8 Clock Out and run into a Clock Divider with an EVEN division. Take the Divided by 16 Clock Out and run into the Clock / Trigger input of a Sequential Switch. Run one CV out from the 1st Sequence 8 into Channel 1 on the Sequential Switch, and run one CV out from the 2nd Sequence 8 into Channel 2 on the Sequential Switch. Now the Sequential switch will switch between the 2 channels evenly, and you can run the output from the Sequential Switch into a 1v/Oct input on your VCO and you’ll have a 16-step sequence. Bam! Do you have any lotto numbers?? Is it okay to use this power supply with sequence 8?